But Hatteras Island adventurers are encouraged to take a second look past the oceanfront sand dunes, and discover Buxton Woods. 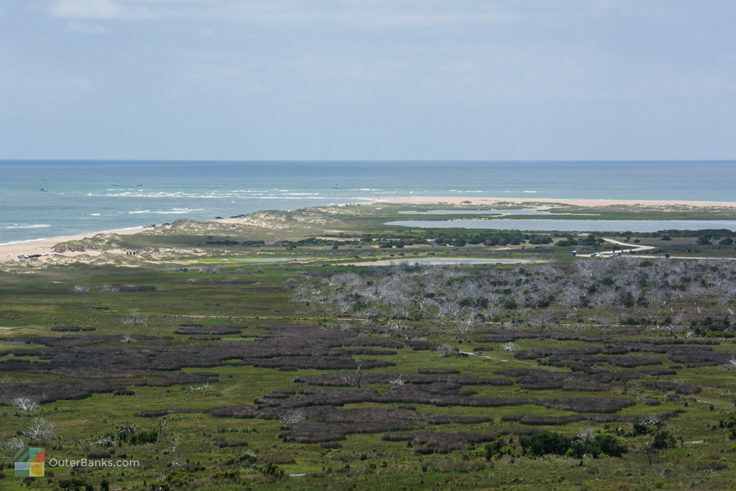 Popular with hikers in the winter and campers in the summer and shoulder seasons, the Buxton Woods and Buxton Woods parcels of land are one of the last open frontiers of Hatteras Island. 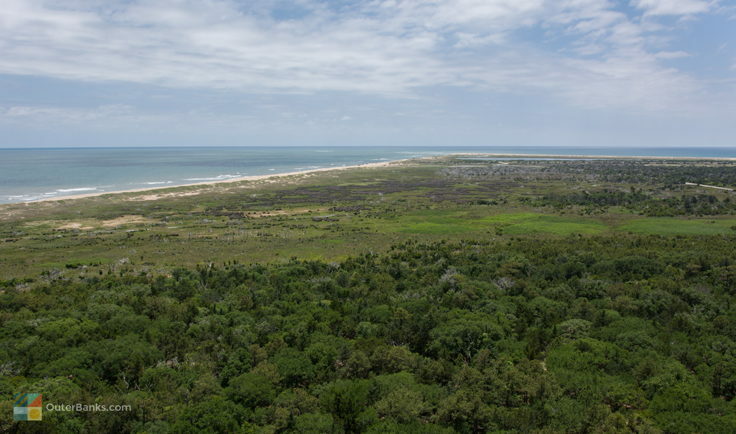 Remarkably undeveloped and remaining in a condition identical to the Outer Banks of centuries ago, Buxton Woods is a fantastic exploration for venturesome vacationers, as well as history buffs who love a real-time view of the historically wild Hatteras Island. Because Frisco Woods and Buxton Woods run together seamlessly, it can be hard to figure out where one portion ends and another begins. Case in point, there are a number of rustic and unmarked nature trails that begin in the village of Buxton and meander to the village of Frisco, with no marker to indicate that the traveler has passed from one village to another. This isn't necessarily surprising, as the town borders of both Buxton and Frisco are both relatively new in the grand scheme of things. Nearly 1,000 years ago, the local Native Americans, who referred to the entire area as simply "Trent," established a community in the area which flourished for hundreds of years. This lush landscape allowed the native residents to track small and even large game species at will, like deer and squirrel, but also enjoy the bounties of the saltwater borders, including fresh seafood and shellfish. In fact, recent excavations in Buxton Woods tracing the roots of Hatteras Island's first residents uncovered piles upon piles of deteriorating shellfish, a clear sign of a healthy and bountiful diet. The local Native Americans thrived in the Buxton and Buxton Woods on Hatteras Island, and only disappeared after European settlers trickled in, although many local historians attest that the Native Frisco residents didn't disappear at all, but simply mixed with the new settlers forming a new, hardy local population. Regardless of the reason for their seeming withdrawal from the area, the landscape stayed pretty much the same for centuries afterwards, and a majority of both Buxton and Buxton Woods remains and will continue to remain intact thanks to preservation efforts by both local and state efforts, designating huge parcels of the island as natural reserves. As a result, modern vacationers can enjoy the same landscape as the original residents, with miles of thick forests, brushy marshlands, and small fresh and saltwater ponds sprinkled throughout rustic trails. Because of its relative undeveloped nature and desolation, visitors won't find many well-marked access points to Buxton Woods. According to many locals, the best way to explore the area is to travel down the back roads and look for rustic trail heads, that spill out of the woods with irregularity. There are two main entry points to Buxton Woods, however, both located in neighboring Buxton. 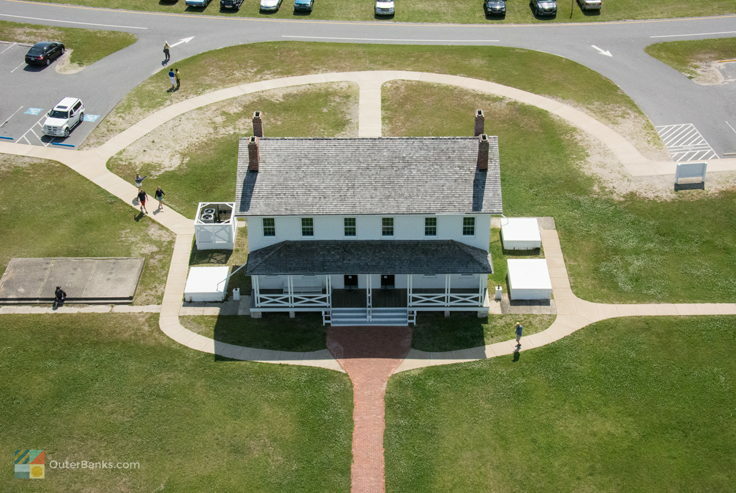 The first trailhead is located just 1/8 mile past the Cape Hatteras Lighthouse, adjacent to the British Cemetery. This trail begins as a wide open route through Buxton, and gradually narrows as it crosses the town line and delves deep into Buxton Woods. Approximately 7 miles long, this rustic trail takes visitors along the borders of one of Buxton's biggest ponds, through thickets of dense woods, and random patches of oceanfront-worthy sand dunes that tower above the landscape, and even provide distant views of the Atlantic Ocean located nearly a mile away. The other popular route is located on Water Tower Road, located across from the Fish House restaurant at the edge of Buxton's town limits. Head down this gravel road, and you'll find makeshift parking areas next to a series of trails that wind through the maritime forests. These trails can be wide and level easy walking paths, or tricky uphill trails that overlook the swamps and marshes below. 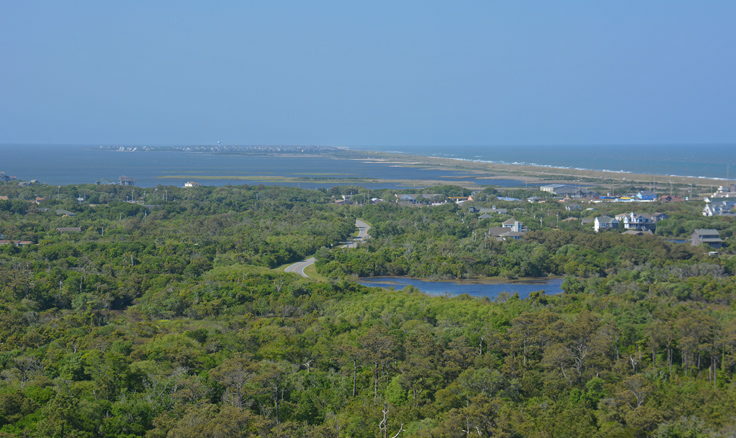 Buxton Woods has a claim to fame as being the home of some of the highest points on Hatteras Island, and on several of these trails, visitors swear it feels more like a mountain hike than a stroll through a barrier island's maritime forest. 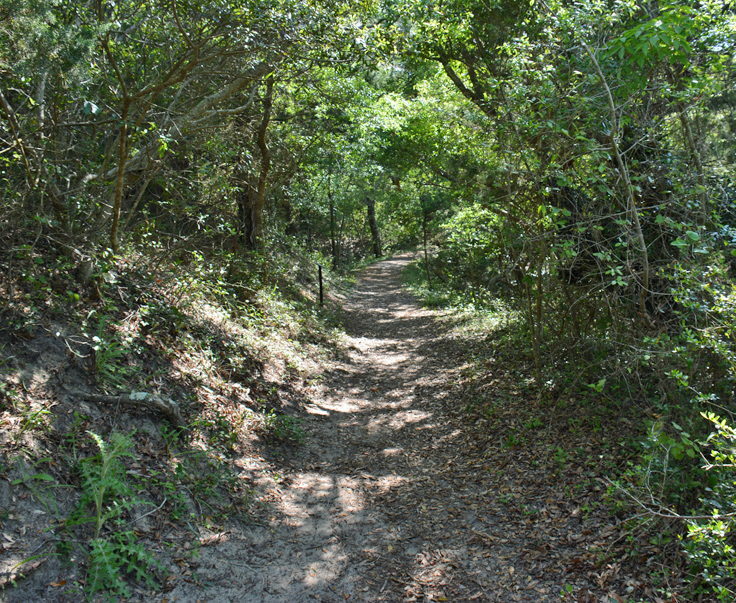 Visitors who are intent on exploring the woods, and have a keen sense of observation, will find countless trails through the oceanside roads that venture into the woods. For true explorers, perhaps the best route is to trawl the area's longest wooded roads, like Spencer's Wood Road, and simply look for those unmarked paths running deep into the woods. These ramshackle explorations often produce the most surprising vistas, from huge brackish ponds that are ideal for kayaking, to towering sand dunes with views of the distant Atlantic Ocean. An adventure in these parts makes it perfectly evident why the area was so attractive for the early Native Americans. Because of the diversity of the landscape, Buxton Woods is the home to a number of unexpected species. With both saltwater and almost freshwater ponds, and a canopy of pines or centuries-old live oaks, the maritime forest is able to support a variety of species that are veritably unheard of on a barrier island. These species include red-tailed foxes, raccoons, river otters, mink, deer, squirrels, and even a variety of forest-dwelling or marsh-dwelling birds like cardinals, falcons, owls, and even American bald eagles. Buxton Woods also has its fair share of reptiles, which make quick skittish runs across the nature trails. These species include green anoles, eastern box turtles, and southern dusky salamanders. Perhaps the most famous supposed resident of Frisco and Buxton Woods, however, is the alligator. For generations, locals have spread news and stories of the local Buxton and Buxton Woods alligators sneaking into their yard and snagging a chicken, or in modern times, simply lounging by a pond as an impromptu tour group travels through. The legend of the Buxton and Frisco alligators have persisted for generations, and despite any photographic or video evidence, persist still today. As a result, legend savvy visitors always ensure they have a camera in hand, just in case they have the opportunity to capture proof of this legendary Buxton Woods resident while trekking through the woods. While finding a random road and an adjoining path may seem like a dream adventure to some Outer Banks vacationers, some visitors may require a more stable exploration of Buxton Woods. Thankfully, Hatteras Island has several well-tended campgrounds that allow visitors to stay in the heart of Buxton Woods without the long and rustic exploration. The first is operated by the National Park Service (NPS) and is located on the oceanside close to the Billy Mitchell Airport and the 4WD access ramp to Frisco's beaches. This campground has the distinction of being located at the highest point of Hatteras Island, and a small selection of campsites literally tower over the beaches on ancient sand dunes, and offer lovely views of the Atlantic Ocean or Pamlico Sound. Sites that are a little lower in stature are still close to the ocean, as well as the public NPS boardwalk to the beach. Though somewhat limited in facilities, campers will find public restrooms, a wide community boardwalk, park-style charcoal grills for every site, and NPS rangers on hand to maintain security and answer visitor questions. The NPS managed campground is open seasonally, generally from Memorial Day until mid-fall, and accept campers on a first come, first serve basis. Tents, campers, and RVs are all welcome, and visitors should consider bringing their 4WD vehicle along so they can head out to the beach access ramp and drive along the beaches in search of that perfect spot to spend a sunny day. The other campground that calls Buxton Woods home is the appropriately named Buxton Woods Campground. This privately owned and operated campground is located on the soundside of NC Highway 12, (ironic since the majority of Buxton Woods is located on the wide stretches of oceanside parcels in between the highway and the Atlantic.) Regardless, this campground has had a cult following of sorts among Pamlico Sound water sports lovers, including kiteboarders, windsurfers, kayakers, and even stand up paddle-boarders. The campground features an extensive soundfront beach, with plenty of elbow room for equipment set-up and launching, even in the height of the spring and fall water sports seasons when the campground can be completely full. In addition, this campground features a community pool, a community store, and plenty of secluded campsites that are close together, but are virtually hidden amidst dense clusters of cedars and live oaks. The Buxton Woods Campground may be one of the island's most popular campsites, but it is also one of the most seemingly secluded, simply because of its wooded and protected location. Families who prefer a vacation rental home will also find a select number of options available in Buxton Woods as well. These homes are distinguished by their barriers of privacy, constructed by thousand-year old Live Oaks, and pine trees, or cedar trees, which make them veritably hidden from the main NC Highway 12. Despite their secluded locale, many of these homes offer incredible modern amenities, including game rooms, theater rooms, and private pools, as well as fantastic boating or water sports access. For more specific offerings, simply contact your local property management company and ask about their accommodations available in Buxton Woods. For hikers, bug spray is all but required in Buxton Woods, regardless of the season. A warm winter day can produce green flies, black flies, or even mosquitos just as well as a warm sunny day can. Be sure and load up on the bug repellant before embarking on any Buxton or Buxton Woods hike. Visitors who intend to travel well off the beaten path should bring along a cell phone or GPS. Surprisingly, even the deepest parcels of Buxton Woods has cell phone service or internet access, and while the idea of getting lost on a barrier island might seem silly, with the expanse of Frisco and Buxton Woods, it's always a possibility. For a little background on the origins of Buxton Woods, consider a trip to the Frisco Native American Museum, which is located just half mile away from the NPS and Buxton Woods Campgrounds. Not only is the museum chock full of information on regional and national tribes, but the attentive owner Carl Bornfriend is happy to answer questions, and provide insights on the local Native American tribes that used to call Buxton Woods home. For a further education on Hatteras Island's roots, consider attending the annual Hatteras Island Powwow, held every year in Buxton Woods adjacent to the Frisco Native American Museum. This celebration, generally held in April, celebrates both the original inhabitants of Buxton Woods as well as the future of local and regional Native American tribes, and visitors of all kinds are invited to join in the fun. Many locals claim the best time to visit Buxton Woods is in the winter, when the local bug and reptile population has generally left for the season, and the stretches of dormant trees along the landscape produce unparalleled island-wide views. This is all in addition to the fact that the off-season's slightly cooler temperatures make hiking an easier, (and less-sweaty), endeavor. Winter or shoulder season visitors are encouraged to take a little trip off the beaten path, and literally enjoy an afternoon of getting lost in the woods. Most vacationers to Hatteras Island will pass through Buxton Woods en route to the attractions of Hatteras Village, Frisco's superb beaches, or the Hatteras / Ocracoke Ferry docks. Nature loving visitors and history buffs, however, would be remiss not to pull over, find a small residential street that heads deep into the oceanside, and get out and explore. With over 1,000 years of history and exceptional nature paths to explore, not to mention Hatteras Island's oldest and tallest dunes located literally a mile away from the ocean, the Buxton Woods is an incredible attraction that is hidden in plain sight, but encompasses the wild spirit and history of the Outer Banks. What is the Buxton Woods Reserve? 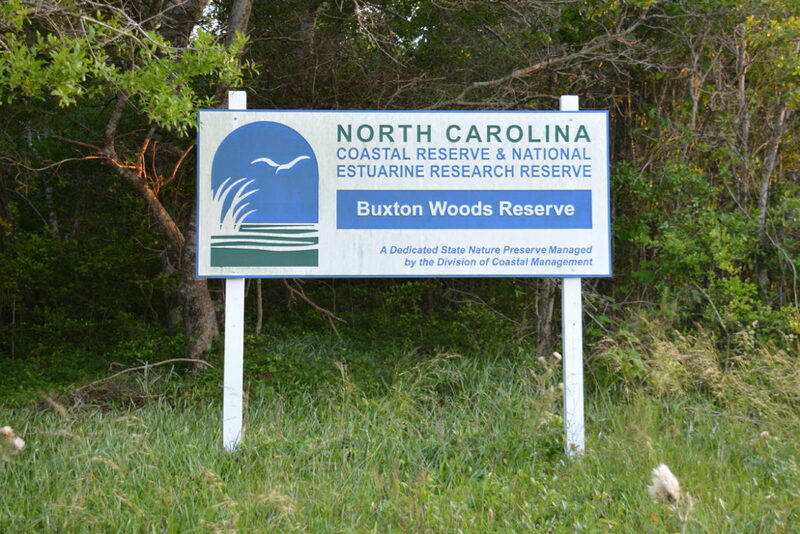 Buxton Woods is a roughly 1,000 acre component of the NC Coastal Reserve System. The reserve is located on Hatteras Island, and is bordered on virtually all sides by the Cape Hatteras National Seashore. The site is distinctive as it is part of one of the largest tracts of maritime forest remaining on the Carolina coastline, and it’s also famed for its unique landscape. Towering sand dune ridges that are thousands of years old are interspersed with swamps and freshwater marshes, shrub thickets, and dense woods - which are all just a few miles or even a few hundred yards from the ocean. Buxton Woods is found within the towns of Buxton and Frisco on Hatteras Island, and extends from roughly the edge of the Atlantic Oceanfront to the borders of NC Highway 12. How large is Buxton Woods? 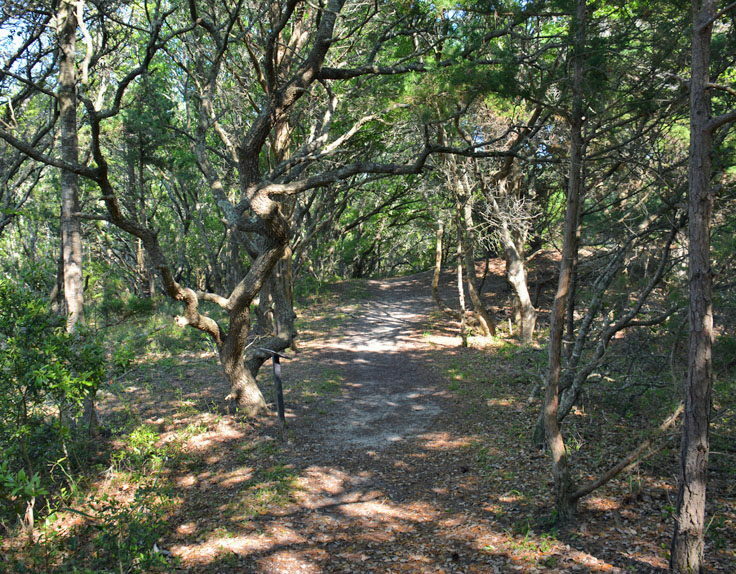 The Buxton Woods Coastal Reserve is a little more than 1,000 acres, however the entirety of Buxton Woods extends throughout the towns of Frisco and Buxton, from Flowers Ridge Road in Buxton all the way to the Frisco Campground. How do you get to Buxton Woods? Visitors can take NC Highway 12 to the northern town of Buxton or the southern town of Frisco to reach Buxton Woods. Multiple hiking and nature trails are found throughout this region, and can be reached via Water Association Road, Flowers Ridge Road, and Lighthouse Road. Can you hike in Buxton Woods? Hiking is a popular activity in Buxton Woods, and particularly in the fall, winter, and early spring months when the mosquitos have disappeared, and the temperatures are cool and comfortable. Buxton Woods offers a number of rustic and sometimes secretive hiking trails that can accommodate all levels of hikers, from beginners to advanced adventurers. Where are the hiking trails in Buxton Woods? Cape Hatteras Lighthouse – a .75 mile long nature trail is found just across from the lighthouse on Lighthouse Road. British Cemetery – Located just past the Cape Hatteras Lighthouse, the wide trail near the British Cemetery extends all the way to the town of Frisco. 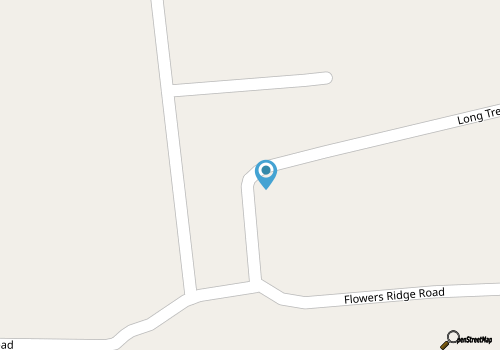 Flowers Ridge Road and Water Association Road – These two residential roads in Buxton have several trailheads and access points. Old Doctor’s Road – Located in Buxton, this road and its subsequent access points are best accessed by a 4WD vehicle. Can you ride horses in Buxton Woods? Visitors are free to ride horses along the trails in Buxton Woods. There are also several local businesses in Buxton and Frisco that offer trail rides for visitors that wind through the woods and area beaches. Can you camp in Buxton Woods? Overnight camping is not allowed within the Buxton Woods Coastal Reserve. However, there are several privately owned campgrounds in the Buxton and Frisco areas, as well as two campgrounds that are managed by the National Park Service and which border the Buxton Woods – the Cape Point Campground in Buxton, and the Frisco Campground in Frisco. Where can you stay near Buxton Woods? There are a number of vacation rental homes that are a shell’s throw away from the Buxton Woods Coastal Reserve. Vacationers can stay in a vacation home in the towns of Buxton and Frisco to easily access Buxton Woods, or at one of the half dozen motels in the town of Buxton. In addition, there are a number of campgrounds in the area, including the Cape Point and Frisco Campgrounds, which are managed by the Cape Hatteras National Seashore. Are there poisonous snakes in Buxton Woods? Like most of Eastern North Carolina, there are primarily two types of poisonous snakes that may be found in Buxton Woods – copperheads and cottonmouths, (which are also known as water moccasins.) Copperheads are more common in the wooded regions of Buxton Woods, while cottonmouths may be spotted in the local marshes and swampy areas. Both species may be spotted year round, but are more prone to hibernation during the winter months when air temperatures may dip below freezing. Are there alligators in Buxton Woods? It’s a local legend that Buxton Woods is home to a small handful of alligators, which have been reportedly spotted over the decades in local ponds, swampy regions, and even in residents’ wooded backyards. With that being said, the chances of a visitor encountering an alligator while hiking through Buxton Woods is slim to none, as the debate of whether or not there are alligators in the woods goes on. Are there mosquitos in Buxton Woods? Due to the dense forests, swamps, freshwater ponds, and almost non-existent human population, mosquitos can be an issue in the summer months for Buxton Woods visitors. In the late fall through early spring, however, mosquitos are almost never a problem, which is why this time of year is one of the most popular times to explore Buxton Woods. How strenuous is the hiking in Buxton Woods? The hiking in Buxton Woods can range from easy to moderate or even difficult. Several rustic and more secretive trails wind up and down dune ridges, circle swamps and wet marshy areas, and can be thick with brush and dense woods. Experience will come in handy for the longer and more rugged trails off of Flowers Ridge and Water Association Roads. Are there restrooms or comfort stations in Buxton Woods? There are no restrooms in Buxton Woods, however, restrooms can be found at the Hatteras Island Visitors Center next to the Cape Hatteras Lighthouse. Can you hunt in Buxton Woods? Buxton Woods is part of the N.C. Game Lands program, and as such, it is open to hunters during a designated hunting season which is typically from early September to February. What are the tall sand dunes in Buxton Woods? New visitors are surprised to come upon a line of bare sand dunes in the middle of the otherwise wooded terrain of Buxton Woods. These sand dunes are part of the former dune ridge from hundreds or even thousands of years ago, when the oceanfront was much farther inland. Over time, the beaches in Buxton have built up and widened, (thanks to continual nourishment from the Diamond Shoals), leaving behind the sand dunes in the middle of the woods. Can you get to the beach from Buxton Woods? Visitors can reach the oceanfront beach from Buxton Woods, but it is often quite a trek that includes a few miles of hiking, and navigation through rugged or even non-existent trails. What kind of wildlife is in Buxton Woods? There are a wide variety of animals that call Buxton Woods home, including reptiles, mammals, insects, amphibians and birds. Mammals that are often spotted in Buxton Woods include gray fox, mink, river otter and deer, while common reptiles and amphibians include green anoles, southern dusky salamanders, and eastern box turtles. What kind of birds are in Buxton Woods? There are more than 360 species of birds found in Buxton Woods, which includes endangered or threatened species such as bald eagles and peregrine falcons. How old is Buxton Woods? Buxton Woods is thousands of years old. Sand dune ridges mark the westward movement of the local shoreline over the centuries, while relics and artifacts indicate that island natives were living in the woods up to 1,000-2,000 years ago. What are the habitats in Buxton Woods? Buxton Woods has a wide variety of habitats which include freshwater ponds and marshes, maritime swamp forests, high wooded dune ridges, and shrub thickets. Do you need a 4WD vehicle to reach Buxton Woods? A 4WD vehicle is not required to access Buxton Woods, with the exception of trailheads along the isolated Old Doctor’s Road in Buxton. Is Buxton Woods open to the public? All of Buxton Woods is open to the public, with the exception of privately owned homes and lots in Buxton and Frisco neighborhoods. When it the best time to visit Buxton Woods? Locals attest that the best time to visit Buxton Woods is in the winter months, when the mosquito population is generally non-existent. Because Buxton Woods has a variety of evergreen species, the woods generally stay lush and conducive for birds watching and wildlife watching all year long.